Not so far in the future, a patient will be lying in a small local hospital and a world-renowned surgeon will be operating on him or her from America via the Internet. Such operations will be carried out by robotic arms, driven by what seems like ghost hands. These arms will be set up by the attending medic and guided remotely by the surgeon. Proponents of telesurgery envision early applications of this technology even further afield – in outer space. They argue that the technology needed is already available: precise servomechanics, force-feedback sensors for tactile feel, motion scaling software, communication links and the algorithms necessary for motion control. These are the features of the computer-enhanced, minimally invasive surgery systems (MIS) introduced by Intuitive Surgical Inc. (Mountain View, CA) which is already used in dozens of ways. A new technology that was specifically developed for applications involving telesurgery combines the surgeon’s natural hand movements with the traumatic approach of MIS. Initially the clinical focus of the Intuitive system was on heart surgery, but since then, it can be used in a whole array of surgical disciplines such as urology, gynaecology and thorascoscopy. Seven degrees of freedom An operation usually proceeds as follows: the surgeon makes tiny incisions less than 1 cm wide and inserts special tubes called cannulas. These tubes create ports into the body and protect surrounding tissue. Three robotic arms are then manoeuvred into position. Each arm acts as a carriage, on one hand for the endoscope and on the other for the pencil-thin tools to be inserted through the incisions. A sliding coupling holds the tool to the arm. Three motors control the arm movements. Two drive the arm forwards and backwards, left and right; the other moves the coupling up and down. 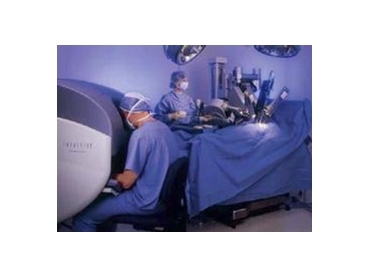 Together they replicate the three degrees of freedom of the surgeon’s shoulder and elbow motion. EndoWrist technology at the end of each tool provides four additional degrees of freedom: inner pitch and yaw, roll and grip. Inner pitch is the movement the human wrist makes when one knocks on a door. Inner yaw is the side-to-side movement associated with waving or wiping a table. Four 25 mm Maxon DC motors housed at the base of each robotic arm drive the EndoWrist via piano strings, while four digital signal processors (DSPs) comprise the Intuitive control system. Capable of performing 300 million calculations in a single second, the DSPs direct every one of the motors.